One person has been killed and at least 12 others injured by knife-wielding attackers at three churches in northern Egypt, police have said. The attacks happened in Coptic Christian churches in Alexandria. The simultaneous incidents took place during Friday Mass. Police say they have three men in custody. Witnesses said clashes erupted between Christians and Muslims outside the churches, the Associated Press news agency reported. Hundreds of Christians had gathered outside the churches in protest at the attacks, the agency said. According to police reports, two people armed with knives attacked three churches. A third man was prevented from entering another church by security guards. But the government later said there had been one assailant, who had attacked worshippers in two churches and been stopped from entering a third, AP reported. According to an interior ministry statement, the number of injured was at least five, the agency said. An employee at one of the churches told AFP news agency that people inside the church had fought back with sticks, but that the attacker had tried to escape through an underground passage. Copts make up an estimated 10% of the Egyptian population of about 70 million. They complain of discrimination and harassment, and there have been a series of clashes between Muslims and Copts over the years. Copts are concerned that new electoral rules are benefiting Islamist parties but not increasing Coptic political representation. BBC Cairo correspondent Ian Pannell says Alexandria is an area where relations between the two communities are tense. 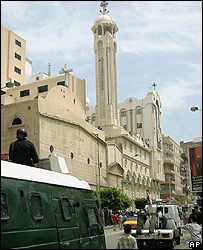 Three people died and many were injured in Alexandria in October 2005 after Muslim demonstrators attacked a church which had put on a play seen as offensive to Islam. The police will have to move quickly and carefully to explain what happened this time, our correspondent says.